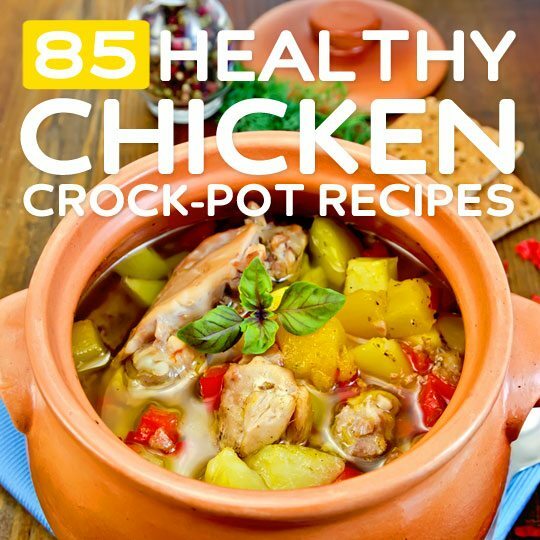 Chicken and crock pots go together like peas and carrots. There’s a very high margin of error here and as you’ll see many recipes have a large window of when they’ll be done, often giving you an entire hour to decide if it’s ready or not. This makes for an easy, yet healthy way to cook for two or more people. 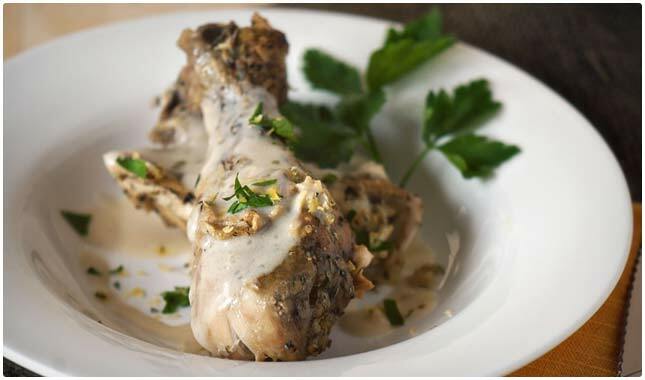 We’ve assembled some of the best tasting chicken recipes you can make in your slow cooker with a strong emphasis on using healthy and wholesome ingredients. Enjoy! Here’s a flavorful concoction that has a few different flavors that you might not experience on a day to day basis. The use of coconut milk will give it a creaminess without adding too much fat. The spice blend is loaded with spices that are known to boost metabolism and even ward off cancer. Ginger is a very cleansing ingredient, often used in health spas for detoxifying purposes. Serve this over basmati rice for a complete meal consisting of a protein in the form of the chicken, a carb from the rice, and plenty of vegetables. Here’s a dish that is easy to make, contains all healthy foods, and will provide a flavor profile that you might not be too familiar with. They’re using peanut butter, chicken, and an assortment of vegetables to make this a complete meal with protein, healthy fats, as well as fiber and other nutrients. The couscous helps hold it all together and keeps you feeling full long after the meal is over. Credit the cabbage for the anti-cancer properties of this meal, and the polyunsaturated and monounsaturated fat in the peanut butter for added nutrition and flavor. If you’ve wanted to try cooking Indian food but wanted a foolproof way to do so, this could be your ticket. All of the ingredients are thrown into the slow cooker so you don’t really have a lot of involvement in the cooking process. This is made according to the Paleo diet method so they aren’t using any grains or dairy. This means that the pizza crust will not contain any wheat, so this is a gluten-free meal as well. It’s not everyday you find a pizza that can be cooked in a Crock Pot and doesn’t contain any wheat, so enjoy! It’s nice be able to take a world tour via your kitchen and sample flavors from different parts of the world. Here Indonesia takes center stage, and they’re showing you a recipe that uses the slow cooker rather than using pans or baking this. The end result is that you’ll have found a new way to cook chicken breast that leaves nothing on the table as far as taste goes. This is thanks to ingredients like peanuts, ginger, and hot pepper flakes. It’s an interesting mix, but sure to make a lasting impression on your taste buds. If you’ve noticed those curry packets in the store but wondered how you could actually use them and how it would turn out, wonder no more. Here they’ve created a healthy chicken crock pot meal that uses a ready-made curry sauce to do the heavy lifting. This really does make it easier than trying to craft a curry from scratch. So combined with using the slow cooker and emptying the packet into it, this requires very little from you in the way of effort. It’s just a matter of buying and assembling the ingredients and setting the slow cooker to the right time and temperature. There are some amazing color in this dish, and it’s one meal that your family will ask for time and time again, for sure. It uses chicken breast, so you’re getting a high quality protein, and it also incorporates potatoes, which will serve as your carb. All that’s then needed is vegetables to create a well rounded meal, and they deliver with an onion and tomatoes so you’re basically covered. 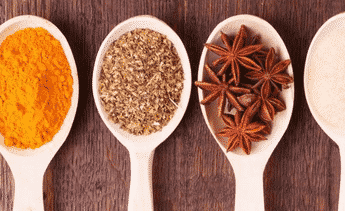 Add to that the use of curry powder and paste, black pepper, and ginger and they’re using an assortment of spices and seasonings that have been shown to have various health benefits. 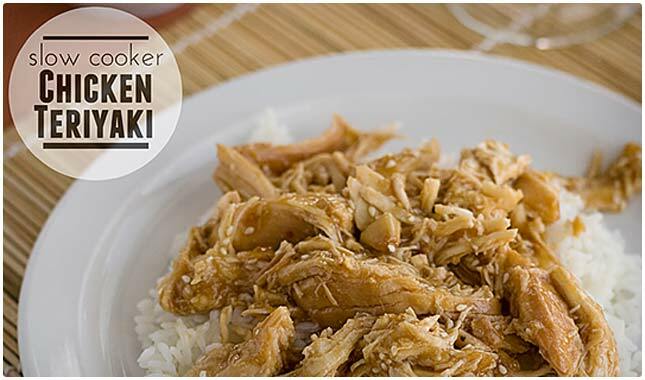 Here’s another teriyaki chicken recipe that goes about things a little differently. The flavor comes from a bottle on this one so you don’t have to worry about getting it just right, and they have a few other ingredients helping it along in the flavor department. Consider that they’re using orange marmalade to give it that zesty orange taste. It also has ginger and garlic so you’re really getting a broad flavor spectrum. Serve it on a bed of rice and don’t forget your vegetable to round things out. A stir fry is one way to make a big meal to feed a lot of people, all with little work, especially when it’s cooked in the Crock Pot. It’s not going to get stirred that much, or fried that much, so it might not live up to its namesake in these regards, but nonetheless the flavor will be present so you will be able to enjoy it all the same. The creator of this recipe says the end result tastes like you brought home some stir fry from your local Chinese restaurant. Here you have more quality control and can be more picky about the kind of ingredients that are going into your meal. It can sometimes be hard to capture the teriyaki flavor used in Japan, but here they’re showing you how to do it without resorting to buying a bottle of teriyaki sauce. Better yet, they’re showing you how to do it in the slow cooker so you don’t have to babysit it. You end up with a delightfully hued chicken with all of the flavor you could want, but without the fat that is generally found in a teriyaki recipe. They recommend serving this over rice, and you can opt for brown rice or basmati rice to make it healthier, or also consider serving it over quinoa for a more fiber-filled alternative. This is a cashew chicken recipe that will help you break the ties with your local Chinese restaurant. They’ve figured out how to get the taste just right so it almost feels like you’re eating out, but without having to leave a tip and from the comfort of your own home. The ingredients used not only contribute to the taste, but also offer plenty of nutrients and vitamins in addition to protein healthy fat from the chicken and cashews. The best part is that the majority of this recipe gets cooked in the slow cooker, so after a bit of prep you can pretty much set it and forget it. How they figured out the glaze on this cashew chicken is still a mystery, mostly because it’s made in the Crock Pot, a kitchen tool notorious for roasts, soups, and chilis, but not really remembered for its ability to cook things in a specific way. No mystery meat here, you get to pick the chicken you want to put in, and although they they say you can use either breasts or thighs here we’d recommend sticking with breasts because it’s a leaner cut so you’re getting a higher quality protein. Serve this with rice and a side of broccoli for a complete meal. This is one of the spicer Korean dishes you can make, but it’s one you won’t soon forget thanks to its deliciousness. This is one of the more popular meals for Korean families eating out, and it also gets cooked at home on the regular rotation for many. It combines chicken with potatoes so you’ll be getting a protein and a carb, and it also has carrots and an onion in it. Traditionally this would be served with a bowl of rice as well as a small assortment of side dishes, usually containing kimchi and other vegetables. The color contrast between the chicken and the broccoli really adds to the appeal of this meal, and you can quickly identify that you’re getting a complete meal here. The chicken is your protein, they suggest quinoa or rice as the bottom layer, and you’re getting a vegetable boost with the broccoli. If you go the quinoa route you’ll be getting a nice fiber upgrade along with the broccoli. The other ingredients are all good for you, and the fact that this is done in the Crock Pot makes it all the more impressive. If you’re a fan of the Orange Chicken from Panda Express, you’ll definitely appreciate this recipe, which tries to replicate that same flavor, but make it more healthy for you. For starters, they’re using chicken breast, so you don’t have to worry about the quality of the chicken. Next, they’re using orange juice for the orange flavoring, so no artificial colors or flavoring agents needed. Basically, you end up browning the chicken in some olive oil before putting it into the slow cooker, but it gets to soak up plenty of sauce while you do other things. If you’re like George and you like your chicken spicy, here’s a creation that will have you feeling the heat and savoring the flavors. For the spiciness it looks like they’re relying on crushed red pepper to get the job done, and there will be added heat from the green chilies that come with the tomatoes. There is also a bit of sweetness added in the form of honey. The nutrition comes from the chicken, the peanuts, as well as a nice assortment of spices and seasonings that add both flavor and antioxidants to it. This dish comes out looking and tasting amazing, and the nice thing about it is it represents a healthier version of sesame chicken than you’ll get at most Chinese restaurants. It’s using chicken breast, and if you want to make it as healthy as you can you can opt for organic chicken breast. This avoids the hormones and antibiotics pumped into conventional chickens. The entire recipe keeps your health at the forefront, and each ingredient contributes to the overall nutritional makeup. Here’s a Chinese food staple, with an added twist. You’ve probably enjoyed cashew chicken before, but with the addition of coconut it’s going to give it a new flavor dynamic that could potentially get you to prefer this to the original. The coconut flavor comes from coconut milk, and they’re using light coconut milk to keep the fat content in check. This means that you can enjoy it, because it has healthy fats from the cashews, and plenty of protein from the chicken breast. Here’s a simple but tasty peanut chicken dish that uses light peanut butter to keep an eye on your waistline, while still giving your mouth something to enjoy. Serving it with rice provides you with everything you need for a rounded meal, but consider cooking up a veggie for a side dish to provide the extra vitamins and minerals you might not be getting otherwise. We like the short list of 8 ingredients, with the surprising addition of salsa to the mix. This is the first time we’ve seen a Mexican food mixed in with an Asian dish, but it works. 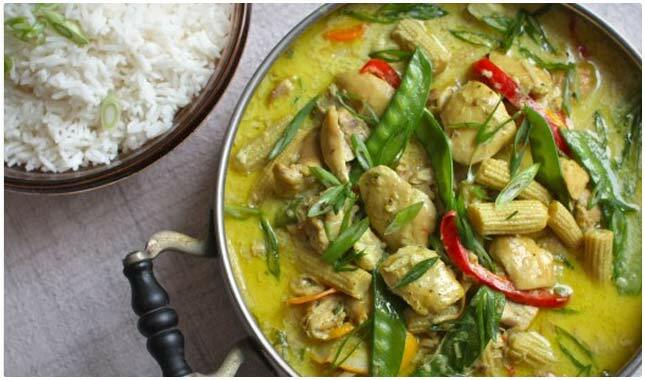 Here’s a chicken dish with a Thai curry inspired flavor. There are plenty of ingredients adding to the overall flavor profile here, and you’ll get some nice contrast between the curry and the banana, as well as the battle between the acidic tomato and sweet apple. The best part is that all of these ingredients are also contributing to the nutritional bottom line, so you can enjoy this knowing that your body is getting topped up on the nutrients it needs to function at its best. The war rages on between those that prefer the taste of white chili to the more traditional recipe. 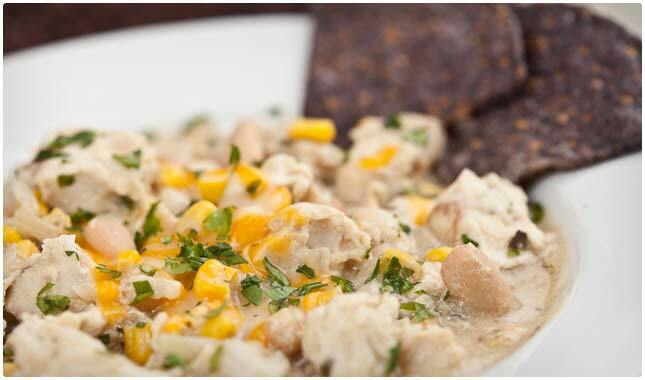 Most white chili recipes rely on chicken as their meat source to stay true to the white title. This means that you’re cutting out a lot of the saturated fat that is inherent in many chili recipes. What it doesn’t mean is that you’re cutting back on flavor or protein, as the chicken gives you the protein and the ensemble cast of ingredients is going to make this chili taste amazing. It’s a complete meal in a bowl, and they say the cheese topping is optional, and we say pass on it to keep it healthy. This white bean chili is going to have a lighter color than you typically get with traditional chili recipes. They’re keeping it healthy by keeping things uncomplicated, and they’re also trying to stay on budget, so you get foods that are frugal without sacrificing their nutritional value. They’re still using chicken breast rather than other cuts of chicken that might not be as expensive. They even manage to sneak a can of refried beans into this recipe, which is a really smart idea for a chili that we haven’t seen before. Overall, 8 hours in the slow cooker later and you’ve got a winner. Infusing chili with barbecue flavor is genius, and that’s what’s going on here. Chicken goes with barbecue sauce so well it’s like they were made for each other, and they’re using chicken breasts which are really good at soaking up the flavor, and keep it very healthy and lean. The use of diced green chilies, three different beans, and garlic cloves gives it all the textures you’d expect, and some unexpected flavors as well. This is a chili that could have just as easily made it on our Mexican recipe section, but it’s here because it’s taking a popular dish like chili and transforming into another popular dish: chicken tacos. All of the pieces are in place here that you’d expect in chicken tacos, but there are also some chili elements, particularly the use of chili powder and beans that makes it a true fusion between the two. All the while they’re keeping things on the healthy side with the use of chicken breast, corn, beans and onions so you don’t have to feel guilty about eating them. Before you write off this recipe because you see the word cream in it, notice that they give you the option to use a reduced fat cream cheese. This will keep the total fat down, and when you take into consideration all of the other ingredients that are going into this, and their nutritional properties, it’s worth trying out. The taste is going to be incredible, as it’s using two different types of beans as well as a packet of ranch mix. It’s throwing convention to the side and giving you a chili that doesn’t really fall in line with what one usually thinks of when making or eating chili. This doesn’t make a soupy chili, but rather one that is thick and chunky, and almost looks like you could eat it with a fork. Pineapple is often used to Hawaiian up a meal, and that’s one of the factors of this recipe. You’ll also see that they’re using cumin, ginger, and Ro-Tel tomatoes so it’s not going to lose its chili identity. The use of BBQ sauce will give it a smoky flavoring and familiar flavor, and help to round things off. The list of ingredients is full of foods that will be beneficial to the body, so you can’t go wrong with this choice. If you’re a fan of quinoa like we are, you’ve probably tried several quinoa recipes by now, but perhaps haven’t thought to make a chili with it. It’s great for adding texture to the chili, as well as an array of vitamins and minerals, extra protein, and a bunch of fiber. These are all things that will help with your digestion and overall well-being. It’s super easy to make the quinoa since you just have to rinse it and add it with everything else. At the same time you’re getting additional protein from chicken breast, and a cast of side ingredients all helping to create the finished product. We recommend using organic chicken tenders in this recipe, so that you’ll be avoiding the nasty stuff built into conventional chicken. You will also enjoy the health benefits of beans in this recipe because it uses plenty of them. The end result looks something like a deconstructed chili served over rice, but there really is no official way that chili has to look, so this is just another version you might find to your liking. This recipe is easy enough to whip up, and then you get to walk away for about 5 hours while it’s cooking until it’s fall-off-the-bone ready. This uses tarragon which is going to provide all the flavor you could ever need, but it gets a little help from its friends parsley, garlic, and dijon mustard. Talk about a flavor brigade! Be sure to serve this with a carb and a vegetable so that you can balance out the protein that the chicken will deliver. This recipe can technically be made all in one pot, and it is using a few techniques that are clever. This one is for those that would prefer a little sweetness to their chili, and delivers in the form of honey as well as sweet chili sauce. The reason this is so easy to make is that you don’t really have to do too much to the ingredients before they end up in the slow cooker slowly cooking. It’s also one of those recipes that doesn’t have to go all day, it can be done in three hours, so it creates somewhat of an oxymoron by being a fast slow cooker recipe. When a recipe has simple in the title you know that it’s going to have a short list of ingredients, as well as short list of instructions on how to cook it. This is doubly true when you’re talking about a crock pot recipe because you don’t have to continually check in on it, it just does its thing while do what you need to. In this instance simple means there are only seven different ingredients and five steps from start to finish. This makes it a great go-to meal when you want something heavy but don’t have a lot of time to commit to it. This one is listed at a prep time of just 5 minutes, so it’s basically just dump everything in and walk away until it’s cooked. Don’t worry if you’re serving this to your family because the alcohol will burn away over the course of the five hours, leaving you with a nice flavor but nothing that will get anyone the least bit tipsy. The color it ends up is not too amazing, but you can make it more presentable with the avocado as a topper. This also gives you a surge of potassium, healthy fats, and fiber, so it’s highly recommended. If you’re like us you like ranch flavor, but the fat content of ranch dressing makes you shy away from it at most times. 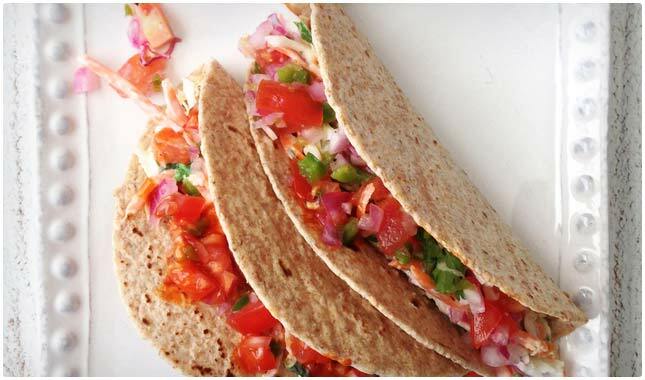 Here’s a way to get that great taste mixed with the classic flavor of tacos, and avoiding the fat. They’re using chicken breast for a low-fat high quality protein, and to make things easy on you they’ve got the taco seasoning and ranch seasoning coming from packets, so you just drop it in and let it simmer and bubble. Ten minutes from start to slow cooker. Not bad! About 15 minutes of prep work for you here, and this is for a very gourmet sounding meal with flavor to match. The key here is that you’re getting things ready before adding it to the crock pot so that it doesn’t come out all bland. Basically the slow cooker is just making it so everything gets cooked nicely without your involvement, and your main responsibility is putting everything in in the right order. Polenta gets the go as the serving suggestion, and it isn’t a bad suggestion to round out the meal and keep things healthy. Here’s another great recipe that only takes up 5 minutes of your time, the rest of the time the slow cooker is taking care of things. You’re basically sauteing the onions a bit before they go in, and browning the chicken. After that it all goes in the pot and you go do whatever you’d like for the rest of the day. For most of us that’s going to be heading to work, and coming home to a wonderful meal that you might have forgotten you already made. This is a complete meal all by itself, so no need for any side dishes. Bonus! Sandwiches always make a fun and easy meal, and this one is no different, except that it’s a hot sandwich and you don’t have to worry about what goes inside the sandwich, since that slowly gets cooked throughout the day. This makes a great summertime dinner where you can start this at lunch time and take it with you to the lake or to the beach for a nice warm dinner without having to spark up the grill. It stays healthy by using chicken breast and romaine lettuce so it’s a win-win situation. The beauty of this one is that the ingredients read like CliffsNotes so even learning how to make it doesn’t take long. It’s basically a shorthand way to make adobo, which can sometimes take a long time when following a traditional recipe. They recommend serving it with rice, which will definitely go with the protein of the chicken. We might also suggest quinoa as a rice alternative, and also to have a vegetable with this for a completely healthy meal. The total time from starting this recipe to walking away from a cooking chicken is estimated at 10 minutes, 15 tops. If the stinking rose is your thing, this chicken has you covered. They don’t hold back on the garlic and it ends up using 30 cloves. 30. If that doesn’t seem like overkill to you then you’ve just gotta try it. Garlic is a very good way to add flavor and also to benefit the body, with plenty of cleansing properties to it. Since you are using a whole chicken here be sure to have an internal thermometer on hand and check to see that it is at the right temperature before calling it done. This jerk chicken comes from a site that is all about getting rid of the gluten from some of the most famous foods people love to eat. Jerk chicken is all about the intense flavors, and they’ve managed to stay true to that while also making it easy to make, with just a ten minute prep time to make chicken that looks as amazing as this does. Four hours later you get to walk back to the crock pot and unveil your masterpiece, that is if you can control yourself for that long with the smells of healthy jerk chicken wafting through the air. 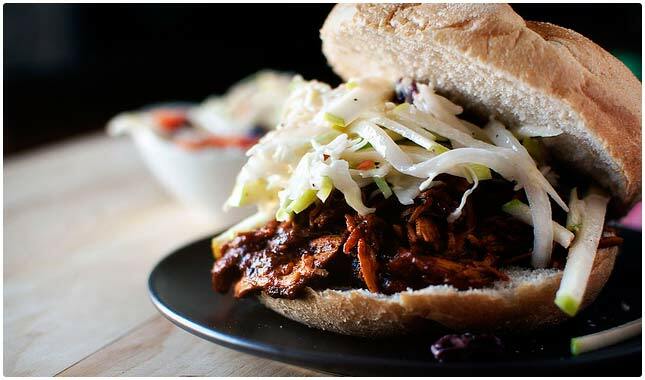 Here’s a BBQ pulled chicken recipe that you simply have to audition for your family. As shown it represents a full meal because they’ve got it topped with coleslaw so you’ve got cabbage as a veggie, and the bun acts as the carb. They don’t just pour the barbecue sauce from a bottle, they show you how to make it from scratch which becomes a handy recipe you’ll want to remember any time you need to whip up a rich barbecue sauce that slants to the side of being healthy. Use organic ketchup to avoid the refined sugars most conventional brands use. Cooking a whole chicken is a great way to feed the family because it’s generally easy to find someone that will prefer the dark pieces, and those that want the white meat. In many households there’s a fight over who gets the drumsticks. This recipe spices things up but only to a medium level for both kids and adults to enjoy. They show it being served alongside a salad, just be sure to balance things out with a carbohydrate as well. With a cooking time of five to six hours you’ve got plenty of time to do other things while this cooks. Pulled chicken is a great dish because it’s easy to make, is very versatile with many ways to serve it, and it’s a crowd pleaser. You’ll likely be asked to make this again, and it might even make your weekly rotation. It’s using chicken breasts so you can feel good about serving this to your family. On top of whole wheat hamburger buns this becomes a meal all by itself either for lunch or dinner whichever you need it for. It also stores and reheats well so you can make a lot of it and not worry about it going to waste. This is a beautiful roast chicken that can easily become your Sunday roast tradition. It comes with its own carbohydrate cooked right with it in the form of potatoes, and it also includes vegetables with carrots and onions. They even provide a tip for how to get a crispy skin on your chicken so even though it cooks in the slow cooker you can get the same sort of experience as if it was in the oven. This makes for a complete meal that is easy to make and feeds the whole happy family. This chicken uses all parts of the bird, and they recommend using bone in pieces. These generally cook up great in a crock pot. The nice part about this recipe is you’re going to get a rich flavor to it with addition of turkey bacon, as well as some additional protein. It gets its name from the tomatoes as well as the different cooking methods involved in this recipe. You’ll be cooking up the bacon separately from everything else, and that crispy flavor and texture blends together with the chicken. They show it served over egg noodles which will act as a carb and help you feel full for several hours after eating this. This chicken comes out looking great, and true to its title it actually has you using lemonade in it. By cooking it in a broth of lemonade and other seasonings you are infusing it with flavor, but really you’re not doing much of anything other than setting it inside the slow cooker and walking away. This doesn’t incorporate any vegetables or any other food items so you’ll need to supplement it with a nice side, perhaps a salad made with kale or spinach, and a baked sweet potato for your carb. Chicken and dumplings can become a family favorite as long as it’s cooked properly, and a slow cooker makes the process almost foolproof. This recipe is great because it is trying to make it as healthy as possible so you don’t have to worry that you and your loved ones are not getting enough nutrition from it. The recipe calls for chicken breasts, which will provide a solid protein, and the biscuits will serve as a carbohydrate. You may want to have a salad to start things off for added fiber and nutrients. Most families go gaga over Philly sandwiches, but the meat used in a traditional Philly leaves much to be desired as far as healthy nutrition goes. These chicken Phillies come in a small size, use chicken as the meat source, and have a zest orange flavor that is sure to satisfy everyone in attendance. You can make these as a fun family meal, or serve them up as a game time treat for guests. It’s your call, and you can feel good about it because it keeps things nutritious with a long list of healthy ingredients, but also keeps things easy with a quick prep time. Sometimes it’s OK to doctor up a recipe full of healthy ingredients to help them taste good enough so you and your family will actually eat them. In this case they have a mix of chicken and broccoli that would sustain you for quite a while, and they have added some cheese to make it taste good. This also includes rice so you’ll get a complete meal from one pot without the need to cook extra side dishes and dirty up any extra pots and pans. This is a relatively easy pulled chicken recipe, and you have a few different ways you can present this to your family. You can use it as a Sloppy Joe replacement, because served on whole wheat hamburger buns it’s going to make a satisfying meal. You can also use it as a sandwich filler the next day. It uses a nice lineup of spices and seasonings, without going overboard and making it too spicy. The serving suggestion with a pile of curly fries should probably get the ax if you’re trying to keep things healthy. Consider a side of broccoli or a spinach salad to complete the plate. The simplicity of this recipe is one that is sure to please even the most finicky of family members. The combination of lime and cilantro is a proven winner, used time and time again in plenty of recipes. The other ingredients in the list all work well together and help to contribute to the overall health and flavor of this recipe. She recommends serving it over brown rice or quinoa. Quinoa is gaining ground in mainstream consciousness as a grain-like alternative to rice and other sides with all the amino acids your body needs as well as extra fiber. You can’t go wrong when lemons and garlic mix together. They both bring equal amounts of flavor the to equation, and complement each other nicely. The recipe has been revamped, making it even easier to get everything into the Crock Pot and get the cooking process started so you can attend to other matters. The serving suggestion they show is right on, with chicken as the protein, bread serving as a carb, and a side salad full of vegetables. This is a home-style and healthy meal that you can easily bring to the table. Barbecue chicken sandwiches are a sure winner with the family, and are great any time of the year, but especially in summer. This recipe is great because many times you just don’t feel like turning on the oven in the summer months, since it ends up heating up the house. The use of pineapple in the sauce is a smart idea, because it will give it that sweetness without losing the savory. This will help win over those in the family that like a bit of sweet to things. Serving these on whole wheat buns is a great idea, just don’t forget a veggie side with it, perhaps baby carrots. Sliders are just fun to make and fun to eat, and your family will definitely want you to make these again, especially if they like things a little spicy. It’s getting that spiciness from a bottle of zesty Italian dressing, so all you have to do to make these not spicy is to buy a regular bottle of Italian dressing and you’ll be all set. It all gets cooked up in the crock pot, so you can make a virtual assembly line of sliders and feed your family on the double. It is also suitable as game time grub so use it whenever and however you need to. This is a perennial kid favorite, so you are really going to have some happy campers on your hands. And since you’re making them at home you get quality control over the ingredients, so it’s far better than any fast food fare you might find. It’s also going to be a healthier option than anything you find in the frozen food section. She’s using a simple list of ingredients which includes such healthy items as chicken breast and olive oil. She’s even managed to sneak in some flax seed, so you’ll be providing extra fiber as well as omega-3s. If you’ve ever tried to make chicken cacciatore the traditional way, you’ll no doubt appreciate the value of making it in a crock pot. Here you’ll get all of the flavors that chicken cacciatore is known for, but in an easy to follow recipe that makes it almost foolproof. The great thing about this is that you don’t need to serve it with anything else because it has all of the components of a well rounded meal. There are bell peppers in it for a veggie, and chicken breast for a high quality protein. And of course the noodles serve as your carbohydrate. Just be sure to keep your portion sizes in check. Here’s a brightly colored recipe that will make you feel like you’re having a Tuscan summer in the back roads of Florence. It will be your secret that it all came from a slow cooker. There are a lot of ingredients being used in the recipe, so you’ll be getting a lot of depth in the flavors. At the same time they are all good for you, things like plenty of tomatoes, bell peppers, onions, and garlic, it’s all working to benefit your body. To keep things very Italian they add just a bit of mozzarella at the end to get things just right. Italian meatballs taste amazing, but to make them healthier it’s good to switch out the meat to something more healthy than ground beef and pork. By swapping it out with chicken you are going to lower the fat content, but you’ll still be getting protein and a meat that is really good at soaking up flavor. This recipe actually has you baking the meatballs first, so they get won’t be all mushy from cooking in the crock pot. After they’re done baking, which only takes 20 minutes, they go in the slow cooker to simmer in the sauce until you’re ready to eat them. Perhaps no other sauce is as Italian as marinara sauce. It’s a staple in so many different recipes that it’s classic flavor has become popular in several other parts of the world. Here is a way to make it without having to worry about stirring the sauce every few minutes. The recipe itself uses some traditional ingredients, and some new twists, but the end result tastes just like you’d expect. Tomatoes serve as your vegetable here, and you have pasta or quinoa acting as your carb, and chicken providing the protein. Perfect! 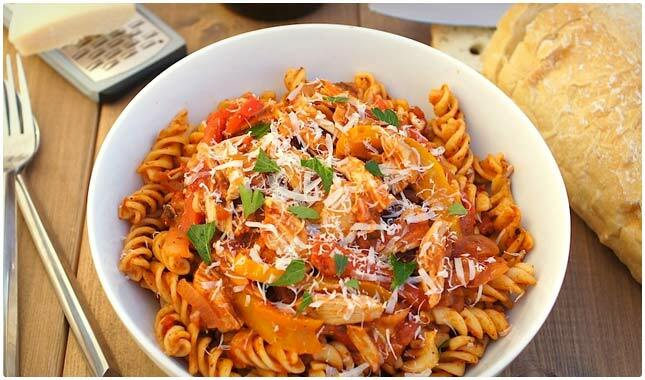 Here is an al dente creation that you don’t have to sweat over. It has a virtual army of ingredients that all combine together to produce a fine rendition of chicken fettuccine. If you generally only order this in restaurants due to the complexity of making it, this is a great way to do it yourself because while there may be many ingredients, they just get mixed together and placed on the chicken in the crock pot. Then set it and walk away, returning later to a perfectly cooked dish. Serve over fettuccine noodles and you’re all set. 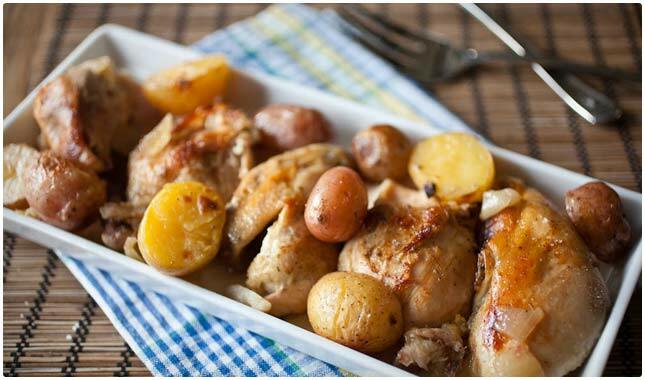 An easy and healthy recipe made with chicken breast. If you like your tacos fancy and even order them in restaurants to try and get them done the right way, here is a recipe you will want to try in order to make amazing chicken tacos with Baja flavors. It’s super easy because it’s all done in the slow cooker, so you basically just get all the ingredients into it, and they’ll simmer and cook up while you’re doing other things. Come back later and you’ve got amazing tacos as well as a special pico topping that you can eat guilt free because it’s using fresh, natural ingredients. This slow cooker recipe features Mexican flavors that will have you making this on a regular basis for sure. It is made with chicken breast, arguably the healthiest cut of chicken, and it also contains black beans for added protein and fiber. Beans are what is called a slow carb because it is digested slowly by the body, and therefore provides sustained energy without a crash later. It also contains corn and bell peppers so you are getting a good assortment of healthy foods. The nice part about it is they give you plenty of different serving options so that you can customize this to your own liking. When it’s Taco Night and you want to serve your family a healthy meal, it’s a good idea to sub out the ground beef with chicken, and an even better idea to sub out the fry pan with a Crock Pot. This means that you will still be providing a decent amount of protein from the chicken, and you’ll be avoiding saturated fat found in most ground beef. It doesn’t get much easier than combining all of the ingredients into the slow cooker and letting things slowly marinate together. The toppings are up to you, but it’s easy enough to keep those healthy as well. This recipe shows you how to make a game day favorite, but with a pretty healthy twist to it. If you are a fan of chicken nachos, here’s a way to cook up the base topping and also keep it hot while the game is happening and guests are trickling in and out. This uses chicken breast, so you’ve got plenty of protein and not a lot of fat. To keep things healthy use organic corn tortilla chips as the chip and swap out sour cream with Greek yogurt. No one will ever know that this is a healthy party snack. These chicken tacos might make you forsake any other tacos you have an allegiance to. They can be eaten without guilt because they’re constructed with ingredients that help your body along, not hinder it. From food items like tomatoes, black beans, and corn, to seasonings like cumin you will be getting both flavor and nutrition from almost everything that goes in. There are even some jalapenos used to give it just the right kick. This makes enough to host a party, or you can scale it down to have a more intimate gathering. This recipe makes a delicious chowder, and you typically don’t see chowders on a lit of healthy recipes. Here you might want to swap out the Velveeta for a less processed more wholesome cheese, but aside from that the other ingredients are solid and somewhat nutritious. The recipe itself is as easy as can be, you just have to put a few things into the slow cooker, let it cook for 6 hours, add some more things and give it two more hours. So out of the eight hours of cooking time you’re only doing things for a few minutes. The beauty of cooking Mexican themed dishes is that they typically have the right ratio of ingredients that are actually digested well by the body. Consider that this is made with chicken breast for your protein source, it contains black beans and corn for a carb, and has tomatoes and green onions for your vegetable. They also say that if you want to you can let this cook for up to ten hours on the low setting, making it perfect to set up in the morning so you can come home to a fully cooked complete meal. If you like to order the sizzling fajitas when you go out to a Mexican restaurant, here’s an easy way to get the same flavors, but without the sizzle. These chicken fajitas have all of the ingredients you’d expect them to, including bell peppers and onions, and of course chicken breast, and it amps things up a bit with jalapeno. This is a meal that doesn’t take all day to make, like some slow cooker recipes, so you don’t want to leave it running all day while you’re at work. But if you want something that takes one to two hours to make, this is your go-to. This recipe is handy because it will make you two different items at once. You end up with some pretty classic tasting tacos thanks to a combination of fresh ingredients and a jar of salsa. For the Mexican rice you’re using all natural ingredients for a light and fluffy side dish. The chicken breast should be enough to account for both the taco shells and the rice, as they both act as a carb. This is not a very veggie-full meal, so you can either add a side of vegetables or just make sure you get veggies at your next meal. This is a simple but delicious Mexican recipe that only takes 15 minutes to go from zero to having everything cooking in the crock pot. The ingredients are a mix of fresh and canned, and packaged so you are not left making everything on your own. If you’ve never used Ro-Tel tomatoes before they can pack quite the kick, so if you’re not really a fan of spicy food you might want to sub them out for regular canned tomatoes. In one bowl, you’ve got a meal that will keep you full for hours thanks to the right mix of carbs, protein, and some vegetables for good measure. Lettuce wraps are always a great way to take a healthy meal and make it even healthier. You’re cutting out the extra carbs that would come from eating this Tex-Mex chicken on a tortilla. You simply must take them up on the option of topping these with avocado slices. By doing so you’ll be adding healthy fat to it, as well as increasing your potassium intake which will help give you more energy, and increasing your fiber which will help it all get digested more easily. If you’re like us you don’t really believe that they’re able to make quesadillas using a crock pot. The two don’t seem to really go together, but what’s really happening here is you’re using the slow cooker to make the inside of the quesadillas, the filling so to speak, and then you cook up the quesadillas the way you normally would, browning both sides of the tortillas. These are going to come out far healthier than any fast food joint, and you get quality control over all ingredients. Consider using Greek yogurt instead of sour cream as a topper for added nutrition. This is a fantastic way to make chicken wraps without getting wrapped up in the process. Everything goes into the slow cooker so you know that it’s all going to bubble together and share each other’s flavors. When it’s all done you put it onto the tortilla and use a press to make it crispy, that’s where the crispy part of the title comes from. Don’t have a panini press? Try using a George Foreman style grill, as it can get you the same results. They mention that much of this recipe is to taste, and you can cut back on the mayo to make it healthier. This is exactly the kind of recipe you need in your arsenal because it contains all of the essential ingredients you need to make just about any Mexican dish. This means that if you just buy these ingredients every time you go to the store you’ll always have at least one meal up your sleeve that you can turn to when it’s time to get dinner started. The set up for this is easy enough, and the bulk of the cooking is done for you while you do other things. You can serve this on top of whatever you want, just make sure it’s a carb like brown rice or some whole wheat noodles. Quinoa is making its way into more and more recipes, and is finding its way into different ethnic cuisines. Here they’ve found a way to add Southwestern flavor to it, and the combination of chicken and quinoa always means that you’re going to get plenty of protein, including all of your essential amino acids met. You’ll also get plenty of fiber and other vitamins and minerals from quinoa that you just don’t find in other foods. We love the diced avocado on top, as this will give you added fiber, extra potassium, and all the healthy fats you need. 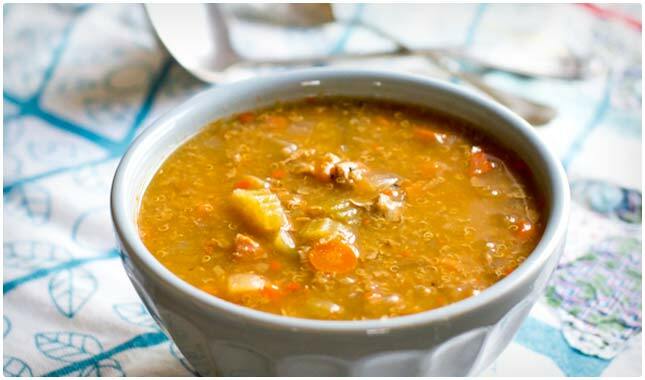 This soup not only has a wonderful color, it is made with quinoa so it has a lot of hidden benefits to it. You’ll be getting a broad protein profile because of the chicken and quinoa as well, including amino acid support. You’ll also be getting a fair amount of protein, as well as fiber built right in because of the quinoa. The best part is you don’t have to worry about how to cook quinoa, because it cooks right in the soup, just be sure to rinse it thoroughly before adding it in to prevent a bitter taste. The accompanying ingredients all add flavor and additional nutrients. Right in the title you can see that this soup is going to be all you need for a perfectly proportioned meal. You’ve got the chicken providing the protein, and they’re using chicken breasts that you cut up into bite sized pieces before adding to the pot, making them easier to chew when you’re eating it. The sweet potato is your carb, and one of the healthiest foods you can eat. The red beans provide fiber, and are digested slowly by the body, giving you sustained energy. There are plenty of tomatoes to give your your vegetable, even though yes, tomatoes are technically a fruit. They say chicken noodle soup is good for the soul, or at least good when you’re trying to recover from an illness or cold. Here’s a way to make up a big batch of it in the slow cooker. Don’t worry if you make too much, as it stores well in the fridge and reheats for a quick meal. A bright mix of vegetables goes with the chicken, and the noodles cook right in the soup, coming out al dente and ready to eat. There is a wonderful assortment of spices and seasonings so this will taste just as expected from a classic staple. If you like the taste of chicken enchiladas, but don’t like the hassle of making them the traditional way, this soup might be just the answer. This is a popular choice in restaurants across the country, and is sure to be a hit in your own home, now that you have a relatively easy crock pot method of making it. The ingredients are all amazing, and amazingly simple to toss together. You just put the chicken in first and then everything else on top of it, set it and walk away. Six hours later you’re sitting down to a soup that sustains like a meal. A lovely mix of vegetables, chicken, and rice make up this soup, and it comes out looking just like you’d expect a chicken rice soup to look like. The only difference you’ll notice is that the vegetables are a little bigger because they’re fresh and hand-chopped. They show this served with bread but you might want to pass on that suggestion because you’re already getting a carb from the rice, and that might make this too carb heavy, causing the snoozies later. It does include enough vegetables that you are getting a whole meal here. Usually when you are eating healthy you’ll want to avoid cream based soups and other recipes because of the fat that is inherent in them. This recipe uses coconut milk for the creaminess, so it’s a bit healthier than using heavy whipping cream or other dairy sources of cream. The recipe itself is very health-focused, and you’re getting everything you need from a meal all in one source, so this is best suited for a light lunch rather than a precursor to dinner. This is definitely a stew, you can tell because you have to decide whether you want to tackle it with a spoon or a fork. Bring both to the task, as this is featuring hearty cubes of rutabaga, a superfood in its own right, as well as chunks of chicken breast and vegetables like carrots and peppers. It also includes kale, so you’re really getting a nutrient infusion and this should have you feeling satisfied with a sense of well-being. A stew like this is great any time of the year, but perhaps is best during the cold months. This is a classic mix of seasonings and spices that is sure to please just about anyone that tries it. The use of pearl barley means this is going to not only fill you up and make you feel satisfied, but it will also sustain you over the next few hours. It’s all done in the slow cooker, so you can fill your home with its aroma all day and you’ll be ready to eat it when it’s done. This is a great way to cook barley because it needs to be tender and it can take quite a bit of time to cook it using other methods. Even though this is a chowder it still manages to earn the skinny label by making it chowdery without using fattening ingredients like heavy cream or whole milk. In fact all of the ingredients are good for you, which means the finished product is as well. An added feature is that it takes just 15 minutes to prep things and get them in the slow cooker, and it cooks for a full eight hours so this is a whole meal for your family that you don’t really have to do too much to pull off. Your secret is safe with us. This recipe ends up using an entire chicken, and an entire beer, so that you get the flavor from the beer, minus the alcohol of course. They get pretty particular about their beer here, recommending a summer ale, so you don’t want to go using a light beer you may have tucked away in your fridge. The nice thing is that the adults can enjoy one of those beers with dinner and it will for sure match the meal perfectly. This has potatoes that cook up at the same time, so you’re getting a complete meal ready to enjoy with minimal prep. It’s not everyday that you can take what usually is a side dish and turn it into a main. That’s what they’ve done here, and you can enjoy the flavors of coleslaw mixed with the savoriness of barbecue sauce, with chicken added to the mix to bump up the protein level and make it a satisfying dish. The use of all that cabbage in the slaw is going to serve as your vegetable, and they even manage to insert an avocado into it. There isn’t much in the way of a carbohydrate, so if you’re looking for a low carb option this is for you. If you love the taste of buffalo wings dipped in blue cheese dressing, you’ll no longer need to hit the pub in order to have that same sensation. This uses chicken drumsticks, so you’re getting a larger serving than you would from the smaller sized wings at the bar. They’ve also attached the blue cheese right to the drumstick so there’s no dipping required. You can serve this up as a dinner option or use it for special game day meals, Serve with celery and carrot sticks to really replicate the experience and add some vegetables to the mix. 84 and 85 link to the same recipe, the bleu cheese crusted buffalo drumsticks… 84 should be BBQ chicken coleslaw, which sounds intriguing, but I couldn’t find it!